How about one that comes with profit? 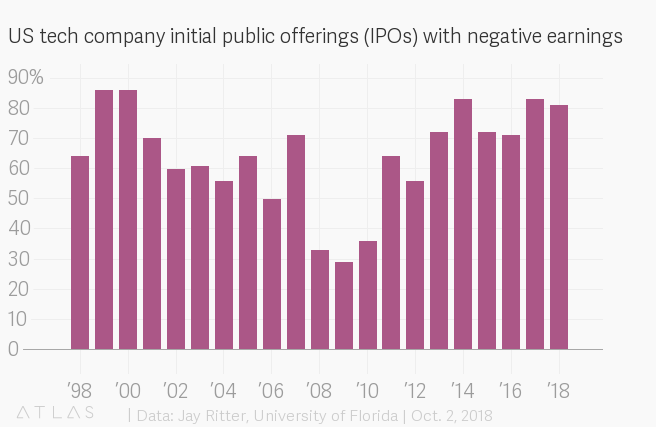 Investors have never been more receptive to initial public offerings (IPOs) from companies that don’t make any money. This year, 83% of all new US public listings have been from unprofitable enterprises, the most on record going back to 1980, according to research by University of Florida professor Jay Ritter. What gives? For the optimists, this data could be a sign that not all stock buyers are the short-termists they are sometimes made out to be. Tesla CEO Elon Musk, after his infamous tweet about taking the electric carmaker private (it’s staying public), claimed stock markets are too demanding of immediate profits. This type of reasoning is also why Donald Trump asked the US Securities and Exchange Commission to study abandoning the quarterly earnings report cycle. Recent IPO data suggests these concerns may be overblown, and that investors may actually be too permissive. Another explanation is the composition of this year’s new stock listings. Many are biotech companies that can expect years of losses and require public capital to fund research and development, according to Ritter, who is sometimes known as Mr. IPO. Other companies could likely be profitable if they were focused on short-term earnings, but investors instead want them to aim for growth by spending on hiring and research, at the expense of near-term profits, he said. Of course, the glass isn’t half full for everyone, and there’s reason to be skeptical about the prospects for these stocks. Investors loaded up on money-losing tech IPOs during the dot-com bubble and got crushed when the euphoria fizzled. 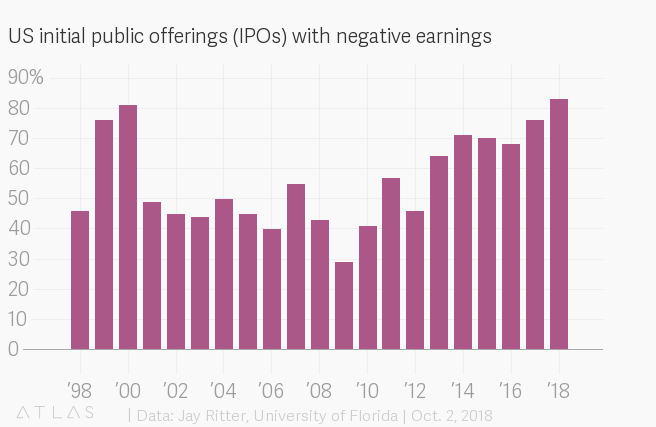 Some 81% of tech IPOs have been unprofitable this year according to Ritter’s data, compared with 83% in 2017, and 86% when the last tech boom crescendoed in 2000. Venture capitalists have also been pouring money into tech companies, outspending the overall IPO market. 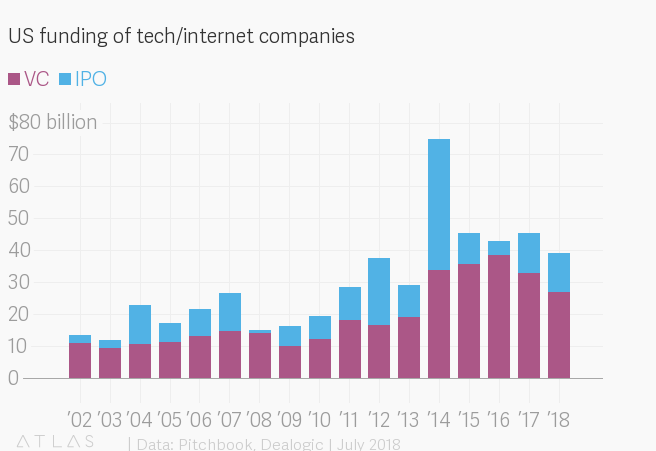 Access to venture funding is likely part of the reason the number of public companies is in decline, and many of the most sought-after startups, like Uber and Airbnb, have stayed private longer. This has caused something of a feeding frenzy around those that do go public, according to the Wall Street Journal (paywall). Are money managers getting carried away? Bond and loan investors (paywall), too, are getting paid less for the risk they’re taking and bargaining for fewer protections against a default. Subprime US personal loans have also increased. There’s no sure-fire indicator that the next recession is about to begin. But after an unusually long period of economic prosperity, these market signals suggest investors are becoming complacent and the US economy could be overheating.